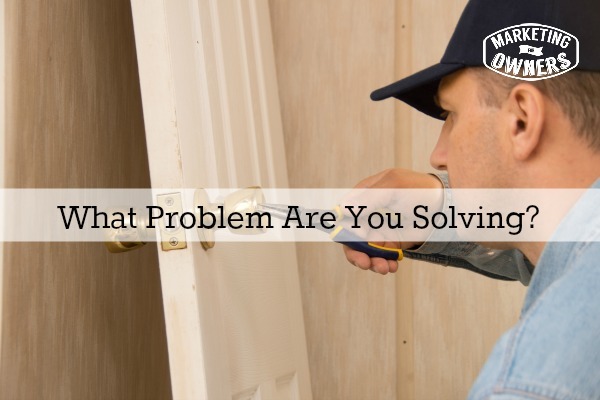 So what problem are you solving now? Everybody has a problem and everybody is looking for a solution to that problem and that’s where you come in. As an example, my fire safety company, Fire Protection Online, we don’t just sell fire safety gear or fire extinguishers. We help people comply with fire safety regulations and we make it easy. We do it so you don’t need any technical knowledge. We do it so that you don’t have any risks because if you buy the wrong things we have 60 day money back free returns guarantee and we give you all the help you need. Doesn’t that sound better than ‘we sell fire extinguishers’? Think about it. The next time you’re considering you’re business, what do you do? Here is another example. I’m in La Plagne in the French Alps on a lovely little ski resort. It’s quiet, it’s at the end of the season so there’s not many people here. Probably someone will go past in a minute but they don’t just provide skiing. What they do for me is they let me get away from work, let me forget all my woes with no pollution, fresh mountain air, glorious sunshine, and not a care in the world. I also get to exercise all day long while having fun. Doesn’t that sound better than just plain, ‘I went skiing’? That’s what they do for me, they provide a solution and I tell you what — one good thing about skiing is because you have to concentrate, I can’t think about work all day long. Apart from when I stop and do this. I want you to consider what solution you’re providing, what problems you’re fixing. 1. Grab your pen and paper: Now, write down what you do and what service you provide. You may be a carpenter, that’s fine. Now I want you to think of why people come to you. What problems do they need? Just think of it as a problem, it’s not because they need a carpenter, but why do they need a carpenter? 2. 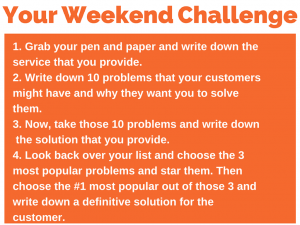 Write Down 10 problems: These are problems your customers might have and why they want you to solve them. Put it in their words not your words, remember it’s all about them not about you. Generally it’s because they can’t do it themselves, they require an expert to do, yes. 3. 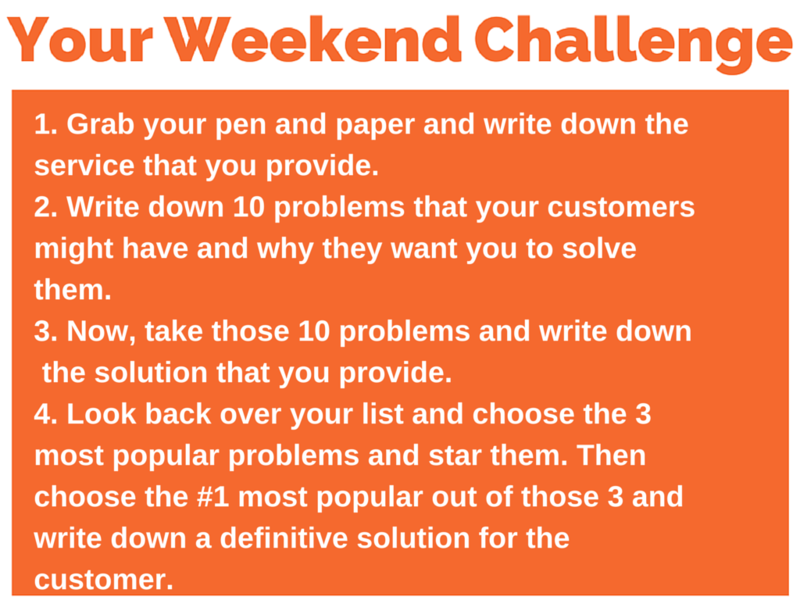 Write down the solutions: Now look at those 10 things that you’ve written down and write down the solution you provide. Again it’s not about you it’s not about, “Oh I provide carpentry services.” Explain the solution. For instance, somebody needs their front door replacing. Their problem is probably their door is rotten, it’s letting the wind in, it’s cold in the house, it’s not safe and secure. The solution you provide is keeping homes warm, keeping homes secure, keeping your family secure. Do you get what I mean? You really do need to think on this one, problems that they have, write down the solutions. 4 What are the most popular problems? When you get to the end look back and pick the three most popular, the three that come up most often. Star those and then look at those three and I want you to pick one as the absolute most popular and then work on it. Write down a definitive, ‘this is the solution we provide for your problem’. The language is for you not we and I, it is what it does for them. Then you have a USP my friends and you provide solutions to people. Now the next time you advertise or the next time you talk a prospective customer I want you to word it like that. It’s going to make a world of difference to your world.